An OS update brings quite a few features and critical bug fixes. However they typically also cause some compatibility issues with applications which may cause them to crash or malfunction after an update. The compatibility issues have been seen with iOS updates as well, and hence IT Admins prefer to have a controlled roll out of OS updates after doing in-house testing on the enterprise applications. Luckily iOS MDM offers a standardized way of deferring the OS Updates up-to a maximum of 90 days. MobiLock lets IT Admins control this setting in the Restrictions section of the iOS Device Profile. Check & Push Updates on all the devices in a Device Group. Check & Push Updates on a single Device. You can check the available updates on all your iOS devices, however remotely updating the iOS requires the device to be Supervised. Enroll an iOS Supervised device. Create an iOS Device Group with at-least one iOS Device. MobiLock backend checks for iOS updates on all the iOS devices in your inventory every 6 hours. Basing on the results, the data is updated against the devices and the groups, and the menu options are updated automatically. This makes it easy for IT Admins to check for available updates at a group level or at a device level. This option lets you see the updates available on your iOS devices in that group and a shortcut to initiate the update on all of them. 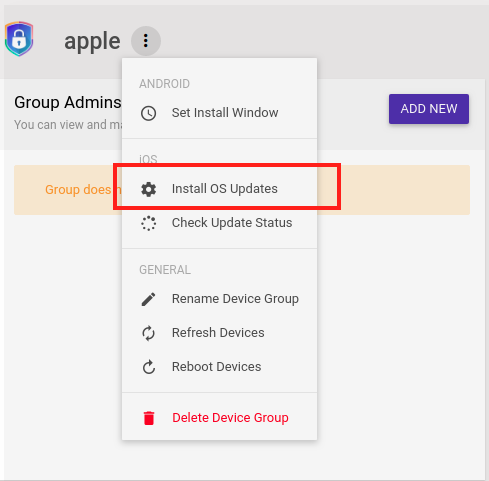 Navigate to Device Management > Device Group. Click on the device group to view the Group Details page. No Updates Available: This is a non-actionable menu item, that indicates that the none of the iOS devices in this group have updates. Install OS Updates: This is an actionable menu item which indicates that there are some devices that have OS updates. 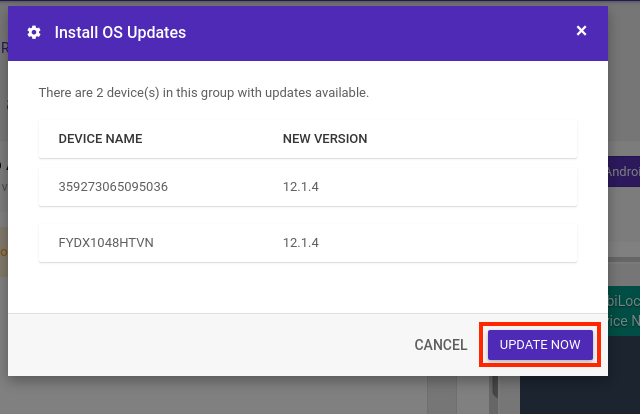 Clicking on shows the list of such devices and provides with an option to initiate an update. 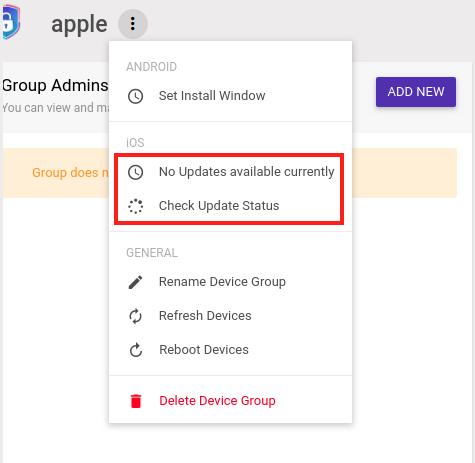 Check Update Status: Use this menu option to check for status of the OS updates on iOS devices. Option 1: When no Updates are available. Option 2: When some devices have Updates. 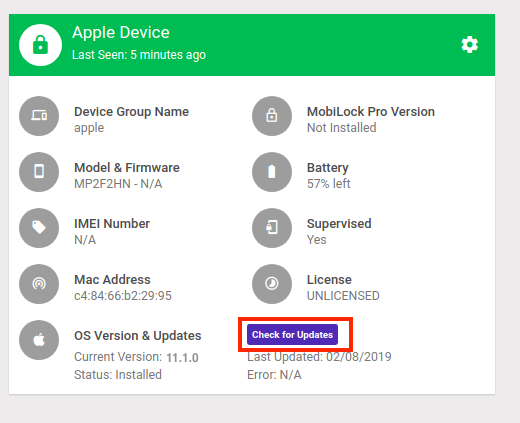 Click on Install OS Updates to see all the devices where there is an update available and then click on UPDATE NOW to initiate an update on all the devices. Once the updates have been initiated, you can check the status using the Check Update Status option from the action menu. The status for all the devices, where the update has been initialized is updated every 30 minutes. Navigate to Devices section. Click on the device to view the device details. Check for OS Updates: This option allows you to check if there are updates available. Clicking on this checks for the Update at that point. 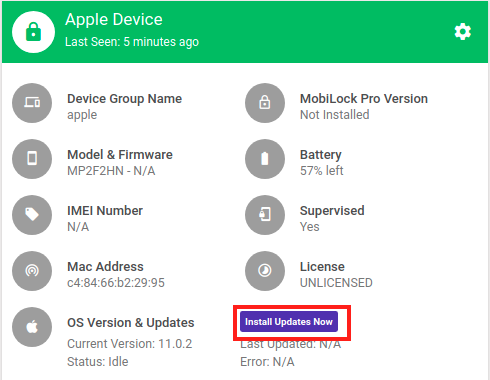 Install OS Updates: This option is shown when MobiLock detects that the device has an update. 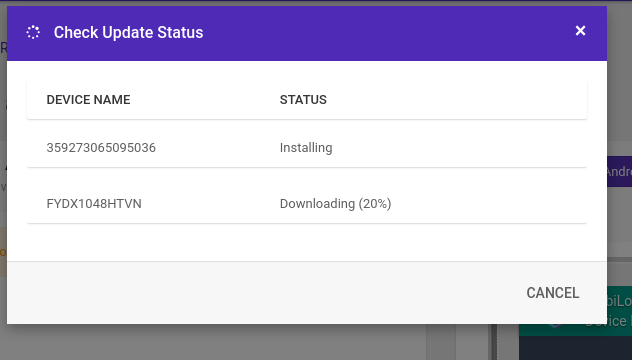 Check for OS Updates: Clicking on this option checks if there are updates available and once the updates are available let's you install it. 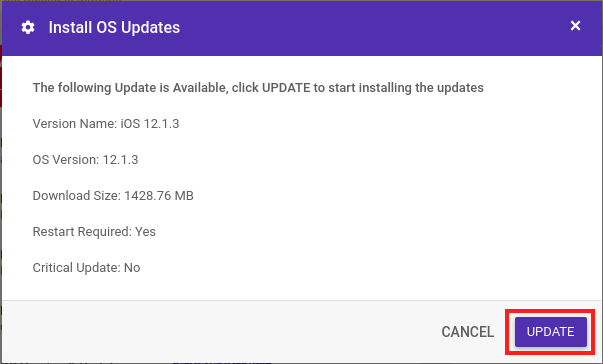 Install OS Updates: This option is shown if there is an update available, clicking on it shows you the update information and lets you push the update. MobiLock queries for the update status periodically and this card is updated every 30 minutes with the latest state of the Update. If the update is successful, then you would see the following information. Question: Although the device has the latest version, we don't see it in Dashboard? Answer: MobiLock checks for updates every 6 hours. If the device got an update after that, then it will show up in the next cycle.